Published: Jun 15, 2010 to ? 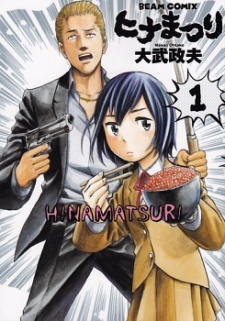 Hinamatsuri has been licensed in English by One Peace Books. 1. This is a full-fledged comedy manga. 2. Despite the unusual setting, this is a slice-of-life manga without 'depressing drama moments'. 3. This is a very awesome and very unique manga. 1. There are a lot of comedy mangas out there, often with some girls talking about random stuff, but most of them aren't really that funny. And that's actually fine! Even though they might not be that funny, still they bring a smile to my face and are worth reading. Well, "Hinamatsuri" is different. This manga is REALLY funny. There were some scenes were I actually had to laugh for a while before I could continue reading. Hina is just such a dumb and weird girl, it's really hilarious, and also some of the situations with the side characters are just pretty funny. What I really like about the manga is how it isn't really exaggerated: Many comedy mangas try to present some 'crazy' and 'over the top' stuff to make people laugh, but not here: Most of the time, the stuff which happens here isn't that unrealistic, it could actually happen in real life (to some extent), and that's also what makes it so good. It's kind of 'real-life-situations', which would be really funny is those actually happened. The art, which doesn't uses SD scenes, but rather 'realisticly warped faces', does a very good job in supporting this. The manga doesn't feel like a completely detached 'fantasy world', but rather something you could relate to, to some extent. 2. "Hinamatsuri" has a very weird and unusual setting: The male protagonist is a respected yakuza member, and one day, a girl with strong psychic powers appears in his appartment and their life together begins. This really sounds like that there will be some real plot to where the girl actually came from, how she got her powers etc. Usually, you'd think the manga would go like this: Parts with lots of comedy, and in between parts with serious scenes (or in bad cases, 'forced drama', see Haganai anime) with no comedic content. There are some comedy mangas which executed this formula well, and a lot which did this miserably. Well, Hinamatsuri is different. There has been no chapter so far which was 'depressing' or had no comedy in it. You know, a manga dealing with serious topics isn't bad, but most of the time, I just want something relaxing with no content which would get me "emotionally worked up". Slice of Life is the perfect genre for this: Just relaxing content, no drama stuff. Every chapter of "Hinamatsuri" stays true to it's comedic nature. There's no chapter where suddenly everything gets tense and serious, no. It's always got it's bright mood. But don't get this wrong: The plot definitely progresses. Situations changes for many of the side characters. Also, we do actually get to know more about Hina and where she came from. But it's all presented in a funny manner and really slowly, so that the manga always maintains it's "Slice of Life" character. Also, some scenes can be somewhat emotional, for example, when a side character has to start living as a homeless person. As I mentioned, the manga doesn't make a "Hoho, she's homeless, how funny! "-thing out of it (like some other exaggerated comedies might do), but rather presents this rather dire situation in an appropriate way. But even so, the mood never gets dark. The character stays strong, and so does the comedy. Here, I also want to praise the characters: They are really really awesome. Not only Hina and her yakuza caretaker, but also many of the side characters, which get into pretty funny situations in their life. 3. The setting is very unique. The comedy is very good. The way how the story unfolds is pretty awesome. The manga never fails to keep up it's bright mood and soon, you will come to love most of this manga's characters. Surprised this manga has this little popularity, its one of the funniest comedy manga I have ever read and i think it deserves more recognition and support as SOL comedies usually don't make me laugh or interest me that much. Story- Slice of life, comedy manga about an eccentric young girl, Hina, who has Esper powers that's currently living together with an infamous Yakuza member, Nitta, and the troubles she always causes him by using her powers whenever she feels like it. Most chapters usually revolve around their home, school, the bar and the dealings of Yakuza activities. The story does not have much progression. However, new characters are introduced and developed along with the main characters and they are absolutely hilarious especially Hitomi and her classmates. Art- Great art, very detailed and oriented nicely. The art is more of a "proper human-like" style compared to other manga as this bears more resemblance to reality showing a plethora of pretty,ugly and funny faces. Characters- The characters are very unique and have their own personal quirkiness. Not only has the author put in a lot of work into the main characters, the side characters as well have their own story to tell which differs from typical manga. First time writing a review, so I just keep this short and simple. Feedback is welcome, will try to improve myself so that I can write better reviews in the future. I am surprised this manga isn't that popular, despite being a hilarious comedy that shares similarities with Yotsuba to! or D-Frag!, implementing the manzai-type of comedy, in addition to a lot of situational and everyday life of humor. It is has a fantasy type of setting, as well as great characters and art style that enhances the comedy greatly. It must be said that it shares some dubious and ridiculous aspects as well that broke a bit with the immersion in the manga. The setting of Hinamatsuri is quite unconventional, especially considering the characters presented. Readers are presented with Nitta, a Yakuza member, who finds Hina in a box one day, a young girl with supernatural powers. Reluctantly taking her in to avoid further problems, the daily lives of both are presented. The fact that she goes berserk whenever not using her powers doesn't alleviate the situation at all. What makes this manga so hilarious are the situations presented: these are for the most part everyday life of events, often easily relatable to the readers. These include aspects such as housecleaning, going to the shop, visiting relatives and the likes. Another addition is the representation of the doings of the Yakuza and adults: these range from retrieving money from loaners, going to the bar, or visiting the cabaret - which are fantastically relayed, due to misunderstandings or the characters themselves. It not all comedy in the manga: there are is also some drama on the stories of the different characters, such as becoming homeless or realizing how their own personalities are. These are well conveyed, in addition to mixing some humour in it, which was surprisingly well done. Another thing that should be considered is the fantasy element to the manga: as story progresses, reader are presented with the supernatural powers, in addition to the introduction of different characters from the world from where Hina comes from. Although such characters are interesting, these remain a bit unexplored after its introduction, returning to these whenever the author felt like. This caused little inconsistencies throughout the story, lacking cohesion between these events; nevertheless, these issues were a minor drawback. The fact that the powers remained unexplored in addition to the world from where the main protagonist came from was lacking. Some events became rather ridiculous as well, such a teenager being able to do everything possible. The characters of Hinamatsuri were one of the most important aspects to the manga, as without these, it wouldn't be even half as good as it is. The cast is not huge, yet sufficiently large to enhance the experience, as well as slowly introducing different ones, all with a variety of personalities than can't really be tied to stereotypes. The most interesting character was Nitta, whose personality an actions were certainly amusing as well as alluring, in particular seeing the hardships related to taking care of Hina. She herself could be described as a dumb and ignorant child, in addition to being egoistic.Although it certainly added to the humour of the manga, I personally disliked her a lot due to her personality. Character development and fleshing out of these are rather lackluster, albeit having some of these presented; however, this did not work against the manga. Moving on to the supporting cast, these were for the most part amusing and interesting, presenting in some cases character development as well as fleshing out of these. This effects in particular the case of Hitomi, Hina's classmate, who evolves to be quite an incredible character, yet rather unbelievable due to her cunning. Other character of interest is Anzu, who becomes homeless and needs to deal with her situation, the author managing to portray the hardships of being homeless, both through the character and the supporting ones. For the majority of the interactions presented, these are well done, albeit exaggerated in some cases, yet immensely entertaining. The different personalities of these certainly enhanced the humor in the manga as well. The art style of Hinamatsuri is befiiting of the story, yet average as a whole, matching backgrounds as well as character designs; although these were generic and simple in most cases. There were also some inconsistencies found such as distortioned faces, yet was a small drawback. However, what stood out are the facial expression of the characters: these easily transmitted the characters emotional state, such as anger, confusion, surprise, you name it. These were hilarious and masterfully conveyed through correct shading techniques, without distorting the characters faces in any way. Hinamatsuri was overall a hilarious manga which I thoroughly enjoyed in the comedy aspect; the more fantastic side of the manga was rather lackluster, yet never really a huge issue, as it managed to maintain me entertained throughout its duration. There were some drawbacks story wise, especially when it got a bit to ridiculous for my liking, as it didn't really fit with it; the comedic slice of life were certainly the most entertaining ones. To people who enjoy reading a comedy based manga it is highly recommended, yet for those who is in search of a good story and deep characters may want to skip this one. Hinamatsuri is easily my most favorite manga and I don't get why it's relatively unknown in the community. It's slice of life with pretty good humor about a Yakuza basically adopting a girl with psychokinetic powers from the future/another dimension (?) - we haven't really reached a full explanation yet. The setting and the characters are each funny in their own way. I'm usually particularly drawn to Hina's own storyline, as well as Nitta's and Mishima's. Anzu's isn't that great, but still passable in its own way. The setting doesn't reset at the end of a chapter, and there's multiple chapters with references to events 30 chapters back and many questions still unanswered at this point in time. The art isn't quite on the same level as other famous slice of life manga, like Yotsubato!, but simply comparing it to Azuma's stuff is already a pretty high bar. Also there's been a noticeable change in storytelling and art style from the earlier chapters to the later ones, and it's basically all only ever getting better. If adoption stories like Usagi Drop or general slice of life with a little bit of action, quite a bit of humor and the possibility, but not the overt use, of magical abilities are to your liking, Hinamatsuri won't disappoint you. Give it a try.